The module “Terrain Vague” will kick off by applying the situationist technique of dèrive, performing with the whole group of participants an exploration of Cittadellarte’s urban surroundings. The aim – to realize, by the end of the week, 1:1 built objects – needs to be taken into account since the very beginning of this process, in order to speed up the exploration. During the first day’s walks, the group will recognize, attracted trough their particular spatial-social situations and phenomena, a range of sites to work on. Using a set of simple recording tools, the characteristics of the sites will be captured. During the second day, we’ll focus on the evaluation and reflection of the founded and mapped spatial situations and phenomena. 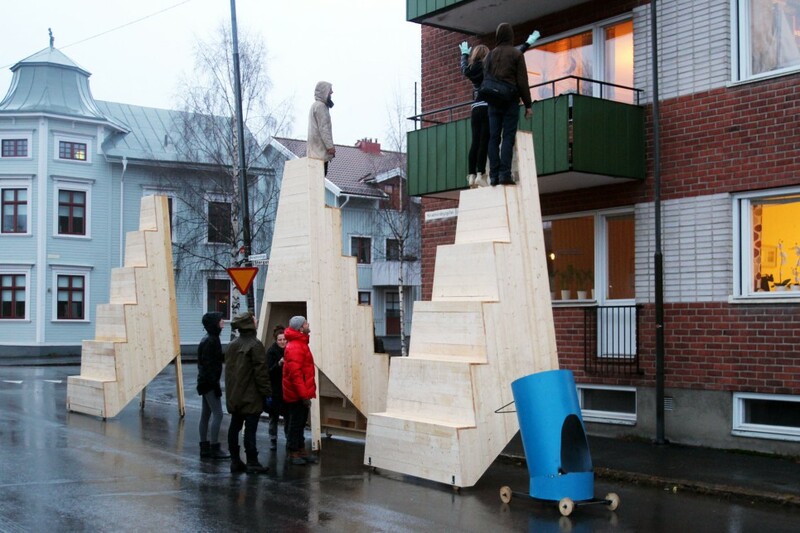 The participants, divided in small teams, will then design and build specific objects for specific urban situations. As portable prostheses for the public space or fixed spatial corrections, these objects will reflect needs, wishes, character of the sites and the citizens who experience them in their everyday life. The material utilised will be standard timber with screws connections. At the end of the week we want to carry out a series of small architectural interventions in the city, with the aim to create atmospheres of communication and exchange or intrusions into a situation of settled habits. A final public walk along the different spots will provide the opportunity to test and reflect the realized objects.